Harvick adjusted his driving line over the closing laps by waiting longer to brake going into a corner as Truex struggled to work his way through slower traffic, he then stayed in front the rest of the way to punch his ticket in the Final 4 in Homestead. Truex led 107 of 334 laps and was still up front until his stumble on the backstretch that gave Harvick the opening he needed,jumping on the opportunity with just 10 laps remaining. Despite giving up the late lead, Truex also clinched a spot,based on points,most he needed to clinch was 56,he left Texas with 76. 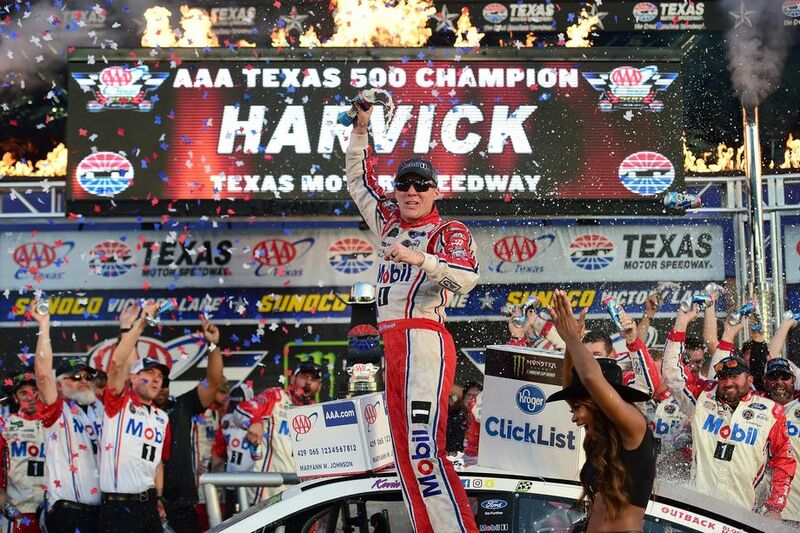 The victory was Harvick’s first of his career at the track. With Harvick and Truex moving on,that leaves only one spot open for Brad Keselowski, Denny Hamlin, Ryan Blaney, Chase Elliott or Jimmie Johnson.Keselowski will go into the final race of the round 8,with a 19 point cushion over closest competitior Denny Hamlin,Keselowski needs to just have a solid race to receive that final spot,this is barring a win from any of the other 4.7 time champ Jimmie Johnson is in the worst shape,as hes dug himself a massive 51 point deficit,hell need a win,very unlikely he can make it just based on points at this stage. Keselowski made contact with Kyle Busch pretty much from the get go. Both had to come down pit road only one lap with flat tires,this left each driver in a hole early on. Keselowski continued to grind during the marathon of a race,picking up spot and getting faster as the day went along. The final race of the round of 8 we travel to Phoenix International Raceway.